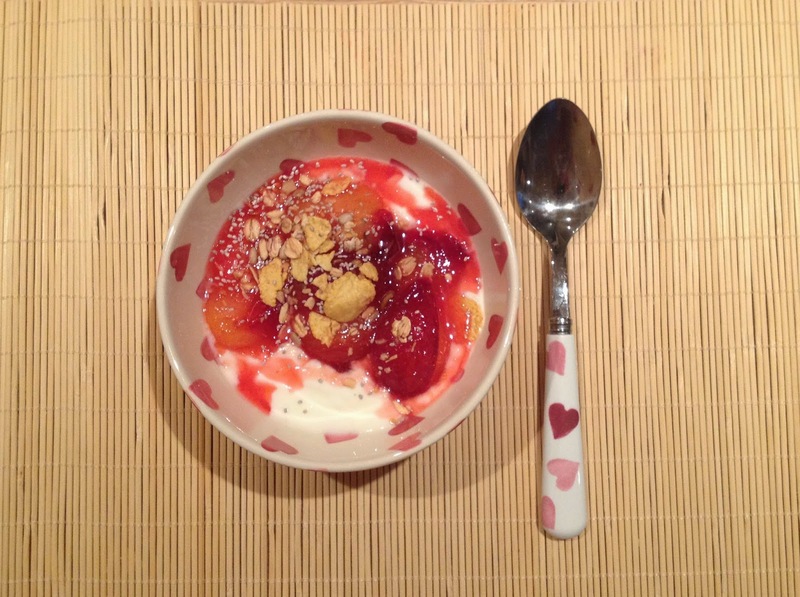 A sweet treat recipe to use up the glut of summer fruit in your kitchen: poached plums. It's been so hot recently I could hardly be bothered to turn on the oven or fire up the hob, but it has thankfully dropped a few degrees for me to make the most of all this beautiful summer fruit. These poached plums take about 15 minutes to rustle up and are a great breakfast to take with you to work the following morning. For a punnet of plums, quarter, de-stone and place in a pan. Add three tablespoons of caster sugar (give or take depending on your sweet tooth – these are quite sweet), two big dollops of honey and a teaspoon of vanilla essence. Simmer for around 10-15 minutes until soft and the skins are just pulling away from the skin with lots of juice developing in the pan. If you don't eat them all up as a tasty pudding that very evening, let them cool and place in a secure container to take to work the next day. In the morning, spoon over yogurt and top with some crunchy granola and perhaps some chia seeds. This also works as a perfect topping forovernight oats.